Taoiseach Leo Varadkar has said he is surprised by the revelations surrounding the Football Association of Ireland and its finances and said questions have to be answered. 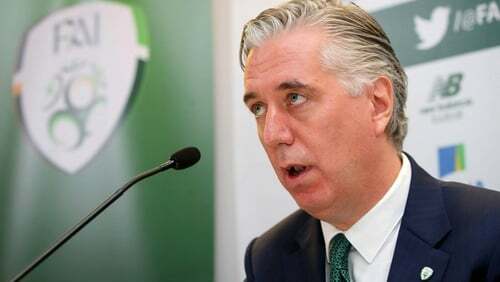 The FAI has said that John Delaney will take a "substantial" salary reduction after he stepped down as Chief Executive and also confirmed the 51-year-old will lead its delegation to an Oireachtas Committee on Transport, Tourism and Sport meeting as planned. In a statement this afternoon, the association said: "As regards John Delaney's salary in his new role as Executive Vice-President, the FAI can confirm that the salary is substantially less than the salary he previously received as CEO." Last week it was revealed the now former FAI chief executive had given the association a €100,000 bridging loan and today The Sunday Times reported that he has been living in a house rented by the FAI for €3,000 a month, which the paper said was in addition to his €360,000 a year salary. Asked about the newspaper report, a spokesman for the FAI said he could not comment on contractual issues involving staff at the organisation. Speaking on RTÉ's The Week in Politics, Mr Varadkar said that while the FAI is not a government body, it does receive "quite a lot of" government funding. Mr Varadkar said he thinks "everyone" has questions they want answered of the FAI. "We'll want to be sure that any government money that the FAI has received has actually gone on programmes that we've paid for," said Mr Varadkar. He said there's "definitely questions to be answered" and that the Oireachtas Committee on Sport is going to hold hearings. Earlier, speaking on RTÉ’s This Week, Mr Varadkar said he thought an organisation of the FAI's scale would have banking facilities to accommodate such a loan. As a former minister for sport from 2011 to 2014, Mr Varadkar said he had no idea that these type of financial arrangements were going on. On Thursday, the FAI said Mr Delaney would head up the group at the meeting in Leinster House, which is due to take place next month. A spokesperson for the FAI told RTÉ News: "That is still the case, nothing has changed there." The association has written to the committee, offering to bring forward the meeting by a week, from 10 April to 3 April. Committee chairman Fergus O'Dowd described the FAI announcement as "a very significant development". Fianna Fáil spokesperson on Transport, Tourism, and Sport Robert Troy said Mr Delaney's resignation as CEO raises more questions than answers over the bridging loan. "The larger question remains. The uncertainty around the loan must be answered and I expect John Delaney to come before the Oireachtas Committee in early April or sooner to answer this," said Mr Troy. The FAI is to begin the process of appointing a full-time chief executive following the announcement last night that Mr Delaney was stepping down. In a statement, the FAI said Mr Delaney would take up a new role as the Association's Executive Vice President with responsibility for UEFA and FIFA matters. Current FAI Chief Operating Officer Rea Walsh will act as interim CEO starting tomorrow.